The invites were quickly done up on the computer with paw prints running across. Nothing fancy. I did politely suggest that no presents were needed. A suggestion of a donation to a local shelter was made for those really wanting to do something. As such there was no present opening ceremony. I do believe that was the best idea of the whole party. Being a 2nd child and only 2 she really doesn’t need more stuff and heaven knows I’m having trouble finding space for it all. The party went smoother without the stress of trying to get a 2 yr old to stay on task of opening gifts and saying thank you. Instead we spread out what gifts were received over the weekend, making each one that much more special. Wish I had done that with Seth at this age. Dog coloring pages were set out for any lulls, though there were few. The kids mainly ran off to play for the 1st hour. Then it was lunch time. We kept it fairly simple with some fruit and sandwich fixings. The theme came through however, with puppy chow mix and dog bone breadsticks. These were a huge hit! I was quite surprised as they were rather made up and I had no idea if they would even work before hand. They’re just Pillsbury breadsticks from a tube with a knot tied on each end. The kids liked them enough that they sent me back in the house to make a 2nd batch. By the time the cake rolled around some of the kids were too full to even eat it. Speaking of cake, it was delicious – an apple sauce cake made with maple syrup and apricot filling. A recipe from an old Martha Stewart Kids magazine. Wish I could find a link for you. 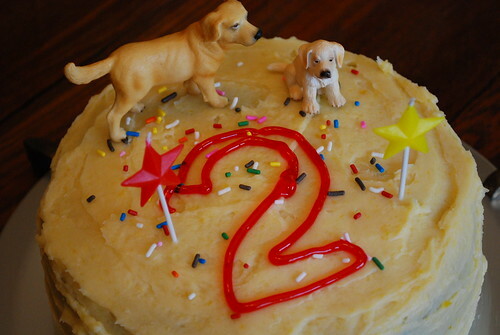 I made the same cake for Seth’s 2nd birthday, but this time my mom was kind enough to “whip” it up. The quotes are because it’s not an easy cake, but worth it. 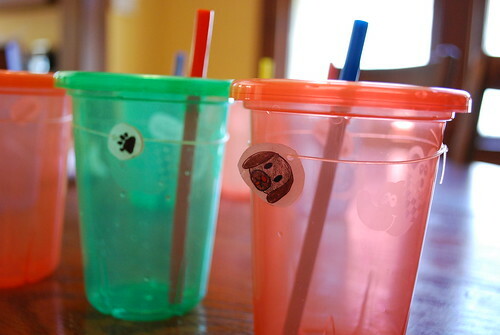 Drinks were also handed out in BPA free plastic cups the kids could take home. I struggled with this a bit. I didn’t want to do juice boxes – messy and wasteful. But I wasn’t handing a bunch of little ones open top breakable glasses either. So the take ‘n toss won. I added shrinky dink charms for easy identification strung on elastic cording. One charm was a puppy related picture traced or drawn by yours truly and the 2nd charm was simply their name. The real fun came with the thank you gifts. I love giving favor bags at kids parties and this was no exception. The bags were meant to be the activity as well as the thank you and therefore a little more thought and effort went into them. They were handed out midstream to keep the party going. Not that the kids really needed it. My wonderful, creative, giving mother also whipped these cute little totes up for each child guest including my younger sister. 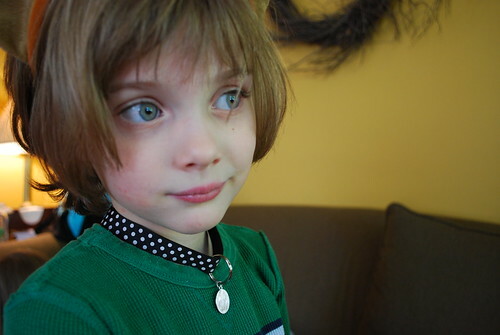 I made the dog collars the nights before with ribbon, iron-on velcro, split rings (like for key chains) and a charm hanging off an o-ring to connect it to the split ring. Eleanor refused to put her’s on. Too bad as I made it a little different from the rest with extra wide red ribbon. Seth on the other hand wears his daily. Of course, this little guy is already making plans for his birthday in a couple months. His current request is for a spy party. We’ll see! This is the funnest thing I have ever seen! 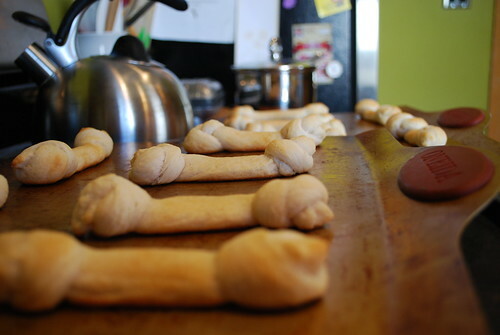 I am going to make those dog-bone bread sticks as soon as possible! wow, how very fun! i should have crashed the puppy party with my 2 pups. just kidding! :) i can’t believe eleanor is already 2. seems like yesterday she was brand new and attending a summer pARTy at my house. Happy Birthday, Eleanor! I love your ears! And those dog bones are brilliant, ma’am. You rock. I swear, when I have kids, you are totally doing their parties — how do you come up with such great ideas??? Brilliant! you are amazing…. I’m saving all these ideas for when Skylar gets there…. You and your brilliant ideas – your kids will have such fun memories of their birthday parties! I once suggested that no gifts be given at one of my boy’s birthdays and the other parents shot me down. Sheesh! What a great theme, it will be interesting to see what you do with the spy theme. And by the way could your children have any bigger more beautiful eyes? 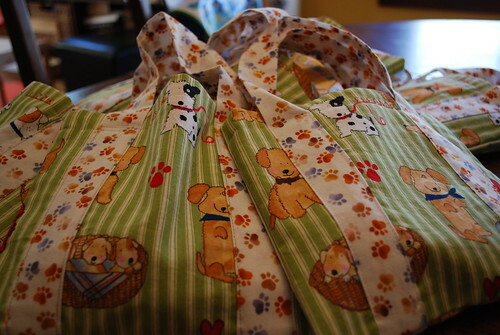 I especially love the give away baggies and the doggy ears; fantastic! Awwww! Totally cute! 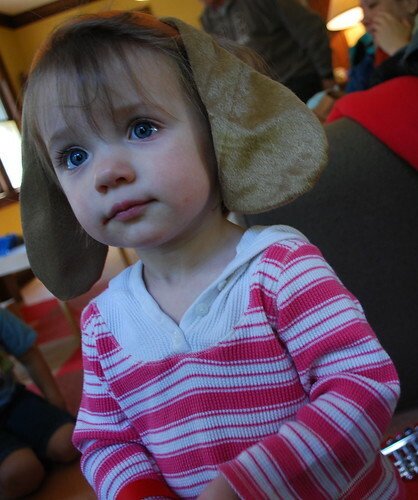 I love the ears! I can’t wait to hear about a possible Spy Party too!